Something very cool happened yesterday afternoon as we went for a family walk to wheel the rubbish bin (it’s a glamorous life on the farm LOL!) down our long driveway to the road. 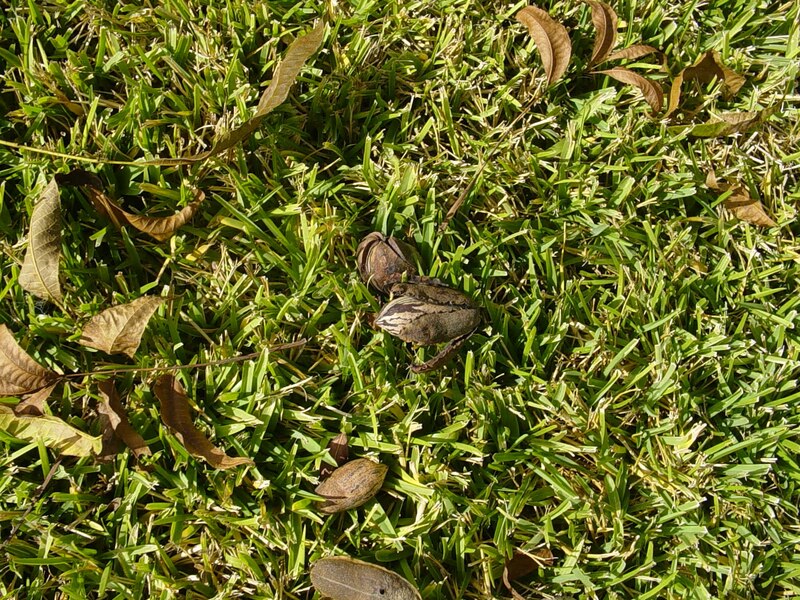 As I trailed behind Ben and the dogs I spied a funny shaped rock on the grass. Only it wasn’t a rock, it was a pecan nut! The straggly-looking trees lining one side of our driveway are young pecan trees and this year was their first fruiting. They were planted before we came, and we’ve nursed them along, not knowing what they were. Oh my goodness. I’m a pecan farmer!!! Ben and I scrabbled around and I filled my apron pocket with nuts. There are still a few more to drop, but it’s not a bad first harvest. 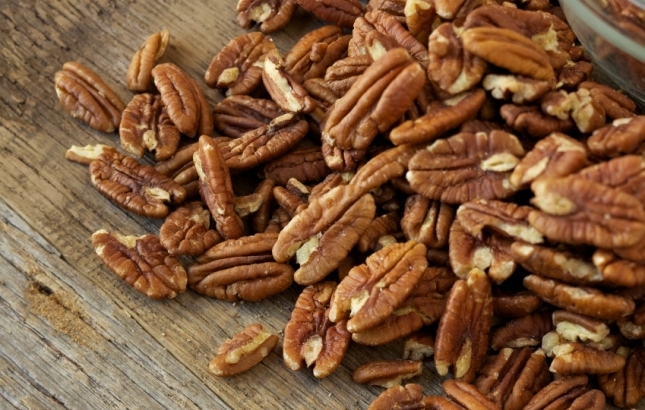 What to do with fresh pecans besides stuff some immediately into your mouth? 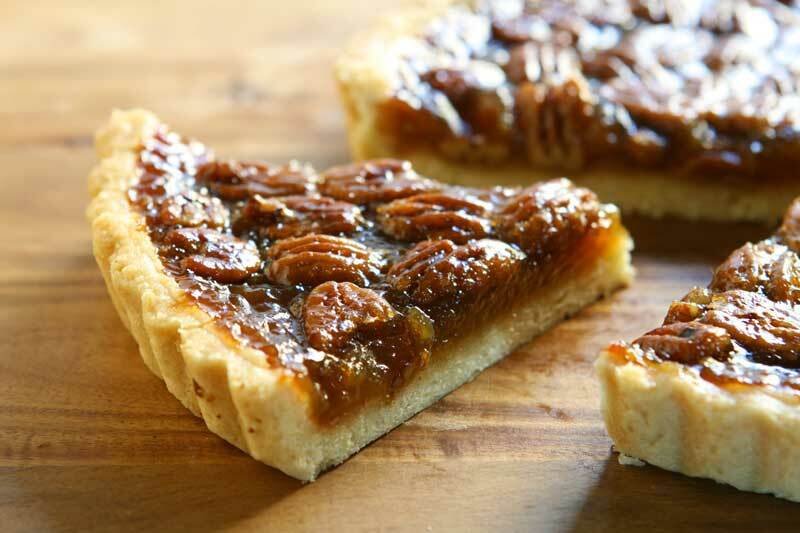 Pecan pie. I love this recipe – it’s easy to make, and not too sweet or rich. Put flour in a food processor, and add a few chunks of butter. Run on, and then slowly feed in the rest of the butter until your mixture looks like crumbs. Add yolk and water and mix again until it is just together (it’s okay to add a little extra water if needed). Dump out onto a sheet of cling wrap, form into a disc, wrap and rest in fridge for ten minutes. Find a 20 centimetre (9 inch) spring-form pan, or pan with removable base if possible, or ordinary pie dish if not! Grease well. Roll chilled pastry out thinly between two sheets of cling wrap or greaseproof paper. Take top piece off and use bottom sheet to turn pastry upside down and manuever pastry into dish. Remove plastic or paper, press in gently and trim off edges. Keep any extra pastry for little pie cases or turnovers etc. Pop back in fridge ten mins to rest. Bake blind for ten minutes (ie place sheet of baking paper in pie dish and weigh down with rice, beans etc), then remove paper and rice and cook eight to ten more minutes until golden brown. Remove from oven and let cool on bench while you make filling. Put all ingredients except nuts in bowl and mix well. Add nuts and stir to cover then pour mixture into pie dish. Cool at least a little before you eat (the roof of your mouth will thank you), and enjoy with cream or ice-cream. This entry was posted in Cakes and desserts, Farm life and tagged easy pie recipe, harvest, nature, organic farming, pecan pie, pecan trees, trees by Cauldrons and Cupcakes. Bookmark the permalink. what a yummy surprise ! Congratulations on your discovery! I felt similar joy when I discovered 2 black walnut trees on my new property this summer. Oatmeal-chocolate-chip-walnut cookies, here I come! 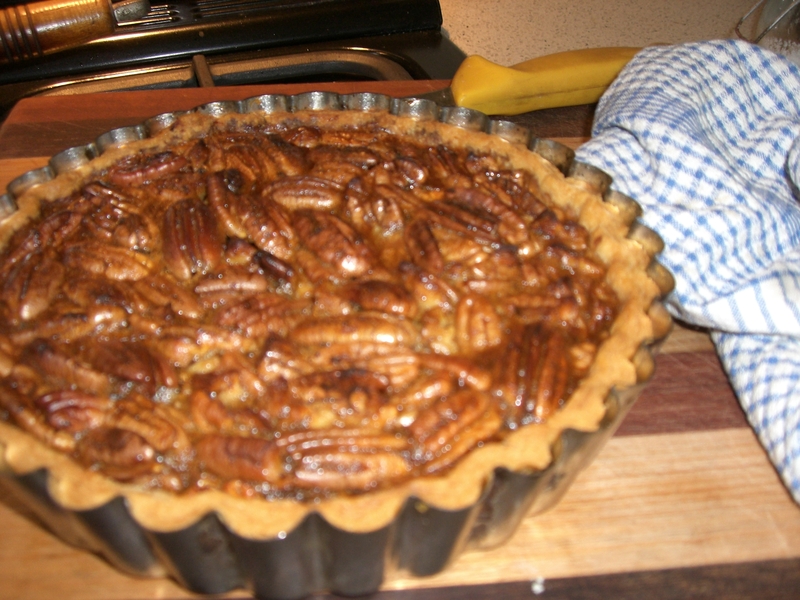 Now I’ll have to visit my Uncles Pecan Tree, Cant wait brings me back memories of great Pecan Pies I’ve got to try. hi Nicole, sounds like an easy peasy recipe and yummy too, what can I use to substitue the eggs.